Inspired by my visit to the Keats-Shelley museum and the room where Keats spent his last days. 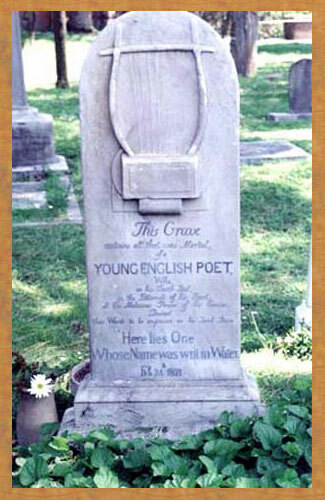 I visited Keats’ grave again and brought flowers. It inspired two haikus. This one and the next. NaPoWriMo Poem 2– Writ in Water? While traveling in Italy, I had the immense privilege of visiting both the house where John Keats died on the Piazza de Spagna and his grave in the non-Catholic ceremony. Both of these visits were extremely emotional for me, as I have always felt a profound connection to Keats’ words and work, as well as been deeply moved by the tragedy of his short life. This poem was inspired by my visit to his grave (Oscar Wilde wrote a sonnet under the same circumstances, but I do not pretend to contend with such mastery). Didst anyone understand the beauty of this world so well as you? Didst any suffer a death so hard as yours? Why can’t you just stay? For those who don’t know, April is National Poetry Writing Month. It’s been a long time since I’ve really actively sought to write for pleasure (besides film reviews), so I thought this would be a good project to help me maintain sanity as I embark on the last month and a half of my master’s thesis. So, here we go. 30 poems in 30 days. Please note, things will probably be posted in spurts and not necessarily day by day. Enjoy the poetry (or don’t, I mean really, it’s up to you).